A collection of Indian and Indian inspired funk! 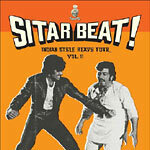 Compiling rare tracks from the 70's and 80's, from traditional Indian music, to Bollywood sound tracks. The strange, psychedelic sounds possess their own cultural mish-mash of flavors -- combining traditional Indian instrumentation and melodies with film music's intensity, and incorporating styles from American/Western music from about 5 years or so behind the trend.